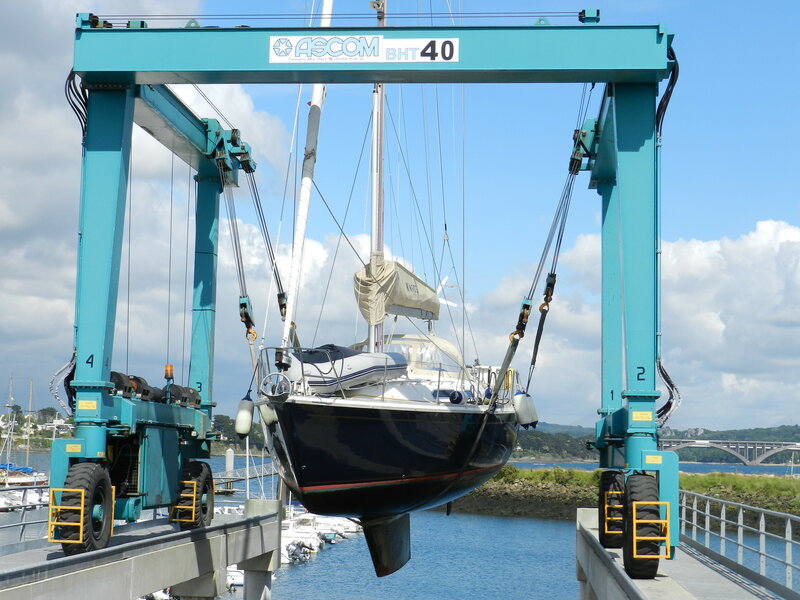 As posted yesterday, we thought that we would go onto the slipway to replace the propeller blades but Bruno Launay – the main man at Brest Marine Services – had other ideas. He wanted us to be hoisted up and held in the sling whilst he fitted the new blades. It would be much quicker but would cost more money. 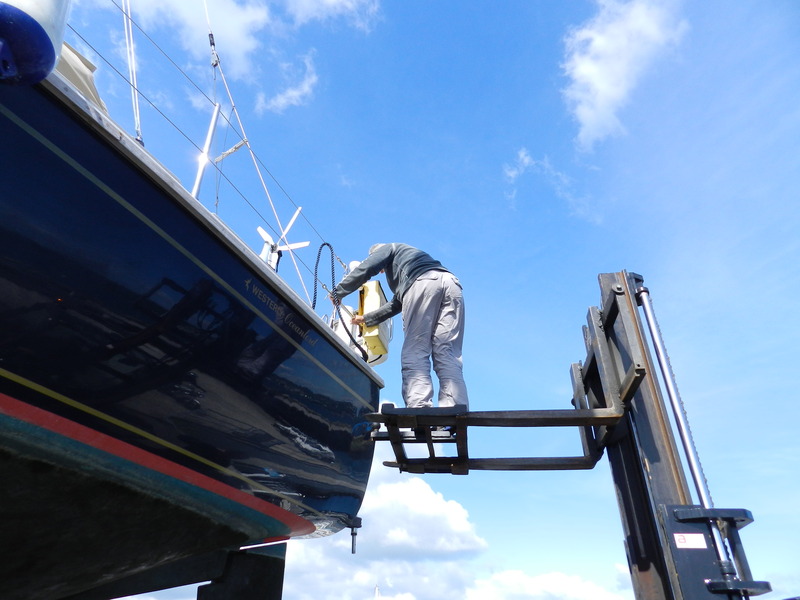 He was worried that something might happen whilst the boat was leaning against the wall and he was working underneath it so we agreed to the lift by the hoist. This was initially scheduled for 2pm but by 3 we hadn’t heard anything so, after a call to Brest Marine it was rescheduled for 4.30pm. At 4.15pm we get another call to say that we need to drive the boat slowly round to the hoist. Really? With the wrong blades on and a brand new engine but with no fan attached at the moment…..
Suffice to say we arrived at the hoist to be lifted. We stayed on the boat until the slings were safely in place and then exited via the bow. She was then lifted in all her glory. It took about an hour to replace the blades so we checked the anodes whilst she was out. These are sacrificial lumps of metal that prevent corrosion of more important bits of metal like our propeller shaft! They all looked in good condition so we didin’t need to worry about changing them. Unfortunately, we had forgotten to take the grease gun for the propeller blades off the boat which was now suspended in mid air! The marina staff offered to hoist one of us up on the forks of their fork lift truck. We thought they were joking but no. Liz was duly balancing on the forks 5m in the air with the marina staff thinking that this was perfectly normal. Can you imagine this happening in the UK???? We then motored back to our berth trying to remember that as the blades had been switched it meant that the throttle was the wrong way round – i.e. pushing it forward meant you went backwards and pushing it back sent you forwards – very bizarre! The mechanic is due tomorrow to do the final bits and bobs so we can do a sea trial. The weather is against us again as there is a front coming through with high winds Thurs pm to Sat so it may be Sunday before we can actually check that everything works. However, it does look like we have a working engine at last! You really are having your patience (and wallets) tested aren’t you. Let’s hope you finally get on your way soon and the new engine behaves itself. One question from me, why have the propellor blades been put on the other way round !?? Thanks Yvonne. Most modern engines are right handed and ours (being old) could have been either left or right handed. As luck would have it (not), they chose to have it left handed so when the previous owners had the Brunton autoprop installed, they had to use left handed blades so that when the blades feather, there go into the correct position. With the right handed blades on, I then had to control the speed the wrong one round (forward/astern) until they switched the throttle cables today. We are trying very hard not to shop to while away the time as we are both now “No income, lots of time” people but we have managed a few things! Amazingly, with wine, bread and cheese are becoming part of the staple diet, we are still losing weight. Gordon says you need a B***** medal!!! I do hope you have photos of Lizzie on the fork lift!